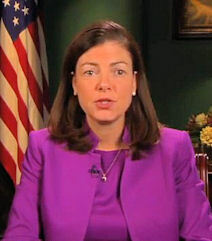 ARRA News Service: Senator Kelly Ayotte: Looming Fiscal Cliff Is An Opportunity . . . I am all for taxation reform and eliminating tax gimmicks and political provided loopholes. That is why I support the Fairtax that has overwhelming bipartisan agreement as the right approach for the American People! Go to www.fairtax.org and learn why 80 of the leading economists in the nation endorse its passage for the sake of our economic future.